Ahead of the all-party meeting called by Lok Sabha Speaker Somnath Chatterjee to discuss the issue of court’s “intervention” in the expulsion of MPs “involved” in the cash-for-query scam in the wake of the notice issued to him by the Delhi High Court, the Supreme Court today referred the matter to a Constitution bench to examine the question whether the Parliament has been empowered to expel its members. Should a defence university be set up in Punjab? Taking cognizance of a petition highlighting government’s communication to the Crown Prosecution Service in London that it had no objection to the “defreezing” two bank accounts of Italian businessman Ottavio Quattrocchi, an accused in the Rs 64 crore Bofors pay-off case, the Supreme Court today directed the Centre and the CBI to freeze them immediately to ensure that no money was withdrawn by him. Mr Praful Patel, Union Minister for Civil Aviation, is believed to have threatened to resign from the Union Cabinet if the privatisation of Mumbai and Delhi airport is not announced within a week. The Opposition INLD today walked out of the Assembly more than once to underscore its demand for the resignation of Mr Randeep Singh Surjewala from the Haryana Cabinet. Several doctors were injured in a clash with a group of Provincial Armed Constabulary jawans in Allahabad-bound Meerut Nauchandi Express train near Moradabad in Uttar Pradesh, leading to a strike by the doctors in many medical colleges across the state, police sources said here today. We have enough evidence that phones of senior Akali leaders including me and my family are being tapped by the vigilance department on Amarinder Singh's instructions. A militant of the Lashkar-e-Toiba outfit, believed to be behind the Delhi blasts in October last year, was killed in an encounter with security forces in Pattan area of Baramula district in north Kashmir today. A Muslim preacher from Bagalkot in Karnataka who is suspected to be a member of the Lashkar-e-Toiba today became the second person to be arrested in the Indian Institute of Science attack case. Pakistan is expected to formally put on the table President Pervez Musharraf’s Kashmir-centric proposals during the Foreign Secretary-level talks between India and Pakistan beginning here tomorrow. 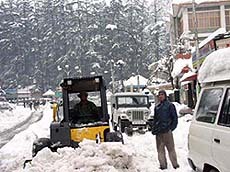 The Kashmir valley remained cut off from the rest of the country for the second day today, as landslides triggered by heavy snowfall and rains blocked the 300-km Srinagar-Jammu National Highway, official sources said.